We’re so thankful for the well wishes, prayers, and kind comments you all left for us. You’ll never know how much it meant to us. Verity was such a special dog, our angel girl, and as bad as her loss has been on me, my mom has taken it much worse. . . it’s been a very difficult week for her. Verity was my four legged best friend and sister, but she was essentially my mother’s other daughter. But Mom has been feeling a little better the last two days, and I’ll get to the reason why in a bit. I planted a beautiful rose near Verity’s resting place today, and I’ve ordered a lovely brick marker from Mason Dixon Bricks and Gifts and two beautiful memorial bracelets (so she’ll always be with us) from Wendy at Wonderful Moments. Both shops were absolutely lovely to work with, and I highly recommend them. You may be wondering if we’re going to get another standard poodle. We are. We’ve had so many people (family, friends, even Verity’s vet) that have been so kind about passing on contact info to standards that they’ve found. We checked into all of them and they all sounded beautiful, but we had decided to wait until next month, or the next, so as to have a little more time to grieve. Well, you know what they say about plans. . . don’t make any 😉 One breeder was so concerned that she called Wednesday to check on us. My mother talked with her a long while, and (I’m still not sure how) we should be bringing home Verity’s little sister (she was our only girl, and I had always promised her a little sister one day and even had a name picked out) next week. 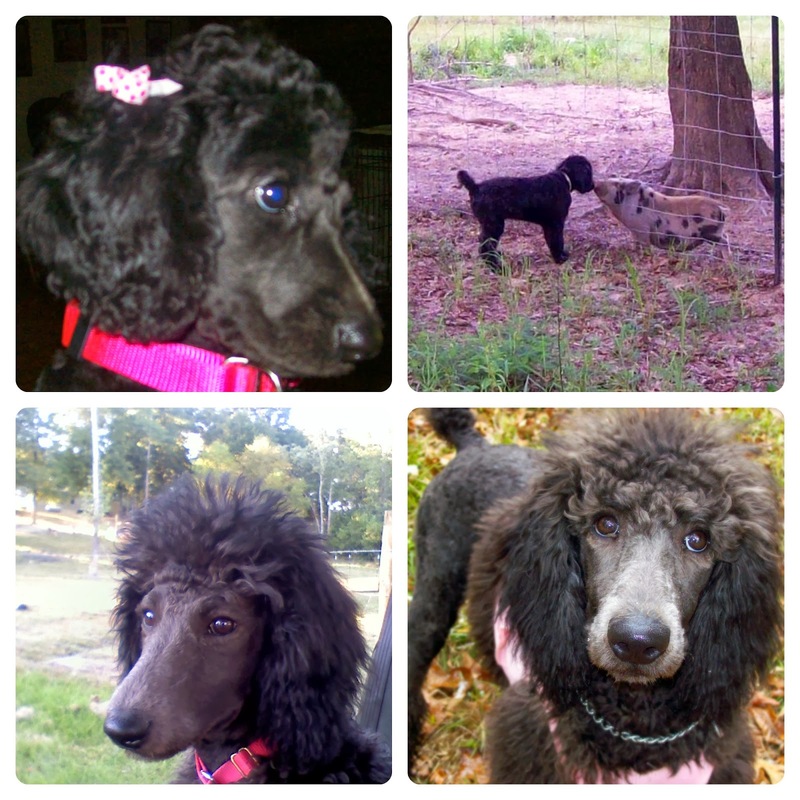 She is black, but black poodle puppies sometimes fade to blue or silver (Verity faded to blue over time). Mom has felt much better (me, too), and says that whenever she begins to get sad, she looks at the pictures of Bryony (that’s the name that I had previously chosen). Even though I was all for waiting a little longer at first, I’m glad that Bryony can bring a little happiness back to our family. Top to bottom, left to right: 8 weeks old and first night at home, 11 wks old and kissing a much smaller Tulip the pig, 4 months old and admiring the pond, and lastly, 6 months old and discovering what snow flurries are all about.